Is a good brand defense the best offense? This is the critical question I probe this morning in an article entitled "Defensive Branding 101 - The Role of Search," which probes whether Search Engine Optimization (SEOs) and other search experts are dedicating enough attention to targeted search advertising against negative search queries. At a time when consumer-generated media (CGM) is unleashing an unprecedented digital trail of negative commentary and opinion that re-circulates to ordinary consumers through search, its surprising that few brands are acquiring "balance the story" shelf-shelf space through targeted search advertising. Speakers and Seekers: The attached chart underscored the role of search as a CGM targeting vehicle. Vocal consumers with good or bad experiences act as "Speakers." The create vast quantities of indexed content on search engines that find curious "seekers," most of whom are simply ordinary (dare I say "typical") consumers doing straightforward product research. Bad buzz, I write in my article, "spreads not simply because consumers hear about it for the first time, but because initial buzz is solidified by the presence of reinforcing evidence. A quick search on bad buzz, a rumor, even gossipy innuendo can trigger a tipping point in consumer perception." "A consumer who hears Mazda has warranty issues will immediately seek counsel from Google and type in "Mazda complaints" or "Mazda safety"...This is where SEM (define) misses the mark. It obsesses with acquisition and shrugs defection. Media planners and SEO experts avoid negative inventory like it's the black plague inside a no-fly zone. Defensive Branding: What's needed is a new form of ad targeting grounded in what I'd call "defensive branding." Under this model, Mazda would consistently have an ad presence in negative search results, always attempting provide deeper context around the issues at hand. If the brand has nothing to contribute, rebut, or challenge, it should clearly avoid this, as this simply risks creating even more consumer cynicism. But in most cases, brands already have content, FAQs, or corporate information addressing to help explain, or wrap perspective, around these issues. 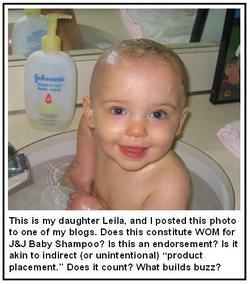 Blog Spam - The End of CGM Innocence?. This morning I logged into my gmail account and found a big fat pile of "blog spam." Two years ago I started writing a blog dedicated to my new Honda Civic Hybrid. Until about a month ago, I enjoyed a steady stream of excellent comments (even critical pushbacks) from various readers about hybrid car experience. Now I'm swimming in blog spam. Yes, I had heard growing warnings from my work colleagues at Intelliseek, especially those who managed BlogPulse, that blog spam was posing a growing threat to the blogophere. But it didn't really sink in till one of my own blogs was subjected to an avalance of meaningless, irrelevant do-anything-for-a-damn-click spam. It's been truly disheartening to say the least, and I can't decide if my reaction is borne of naivette or just being a hopeless romantic about the power and potential of the internet. I can't be the only one feeling such dissonance. The blogophere is bursting at the seams with blog passionistas -- we'll see a ton of them next week at BlogOn -- but blog spam represents a significant "chink in the armor," so to speak. Not insurmountable, but a real challenge,and certainly an issue bearing on the ultimate "trust" scorecard for CGM. Blog Spam Characteristics: Spam bloggers are masters at finding a creative or contextual hook for arresting eyeballs around a given message. Once clicked, they barf up irrelevant, self-serving and useless garbage. It's classic bait-and-switch, but most of it is automated. Many of the same techniques that search-engine optimization firms tout to increase search engine page rankings for brands or companies are put on steroids in the blog-spam space. Just about every blog platform is vulnerable, but some appear more vulnerable than others, especially Google's Blogger platform, which is where I'm receiving an almost endless flow of "no one is accountable" garbage. The Road Ahead: Some of my work colleages such as Sundar Kadayam, Natalie Glance, and Matt Hurst have been applying advanced text analytics to fully "dimension" the spam issue. Expect more news on this soon. In the meantime, let's keep the faith and hope for a light at the end of the tunnel. Last week I fielded predictable set of questions from the media about the impact of Google entering the blog search space. Shankar Gupta's MediaPost piece nicely captured my (and Intelliseek's) general take on the issue, especially around the implications for Intelliseek's BlogPulse, but that's hardly the driver behind this post. What's surprised me most about all the Google+Blog Search coverage is that the most obvious point was all but neglected. Traffic to blogs is likely to surge as a result of Google actively promoting the blogophere, and many sites will see two to three times increases in overall traffic, that's a very big deal. I frankly think that's a conservative estimate. Google Mushrooms Blogophere? For perspective, Google is not only the world's biggest search engine, but it's web's most impactful traffic cop. As soon as it starts prominently featuring a blog search button on the home page, expect to see no less than 5-10% of incremental traffic directed toward blogs. A good reference point here is to look at Google traffic stats on Alexa. Here you can see that 20% of all Google traffic goes to Google content areas other than basic search: images, for example, receives 7% of all traffic. Given growing global curiosity over all things blog-related, couple with Google front-page promotion, I can't image blogs receiving any less on the search front than Google Images. Speakers versus Seekers: Since writing my first white paper on CGM, I've maintained that CGM has the greatest impact thanks to search engines. Most CGM content, in fact, especially blog content, is discovered via search. Outspoken CGM-creators ("speakers") create content that ultimately finds targeted reach among curious users of search engines ("seekers"). This content ultimately competes against "paid" advertising on the search results. What Google is essentially doing is turbocharging the "Speakers versus Seekers" marketplace, acting as marriage broker between consumers with unmet needs ("I seek") and targeted blog results. On the marketing front, this will create both opportunities and challenges for brands. Indeed, the jump from general web content to blog-only content when conducting a search can be both humbling and humiliating for some brands. Bloggers, on the other hand, will rejoice in being discovered and recognized by millions of new websurfers. Some bloggers are already detecting increases. CGM content feeds into search engines, meaning it is easily found by consumers who use the Internet to research products and services. Hundreds of millions of archived consumer comments, some of them rich in specific brand or service experiences, are redefining the notion of the "audit trail" and are raising powerful new standards of accountability and real-time measurements for marketers. Suppose one million consumers search for your brand every month on Google. And suppose the second result is a hostile comment by a consumer whose horrific experience was made worse by an alienating customer service representative. The bottom line? Your brand will suffer. Traditional researchers often struggle with this concept on the premise that CGM-creating consumers are not "typical" or "representative." But vocal consumers armed with high-tech megaphones are having an unmistakable impact, especially considering the high levels of consumer-to-consumer trust. And the sheer volume of CGM—nearly one billion archived comments, and growing at a 30% annual growth rate—makes this form of high-reach and high-impact media impossible to ignore.